Bananas, bananas,!! Yummy, candy-like, tree-ripened flavor of bananas. 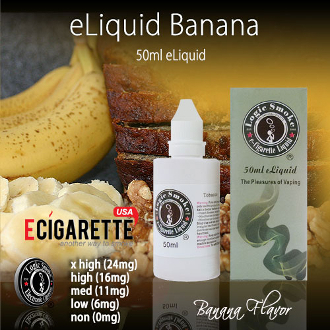 Logic Smoke Banana e cig liquid will take you back to childhood with its fruity and candy-like flavor. Create a more sophisticated taste by mixing it with Logic Smoke flavors such as cheesecake and white chocolate for a scrumptious dessert treat. Yummy e cig liquid with so many of our fruit flavors as well. Mix with coconut, pineapple for a taste of the tropics. Or try peach, mango, or orange. The possibilities are numerous! With the perfect blend of an 80/20 PG/VG mix (propylene glycol and vegetable glycerin: organic, food grade preservative compounds), you'll get the best flavor concentration along with the perfect amount of vapor to satisfy your vaping needs.